In the navigation pane at the top of the window, click Services > Managed Backup. Locate the VM that you want to restore. MBU does not allow file-level restores. Only full VMs can be restored. 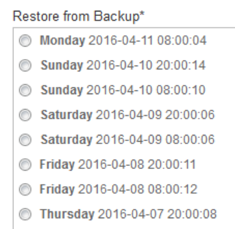 Under Restore from Backup, select the date of the backup that you want to restore. The full path and name of the VM being restored. Where would you like the files restored to? The location where the VM restore should be placed. Any special instructions regarding the VM restore. The restore request is submitted.